The deer’s antlers are possibly the most visible characteristics that have made it the figure of a spiritual superiority Like a crown, the antlers grow beyond its body, bringing it closer to the sky. In many cultures, the deer is a symbol of spiritual authority. During a deer’s life the antlers fall off and grow again and the animal is also a symbol of regeneration. The deer’s fleetness of foot and its longevity are also often commemorated in different cultures. Out of the shin-bone of the fawn, flutes (tibiae) were made which seem to have given forth feeble sounds — whereas Sardinians used to make good ones out of the leg-bones of flamingoes; Pindar’s lyre is described as outringing all the others, even as the Etruscan trumpet outblares this flute. The skins of deer were worn at Bacchic festivals, and one of the five performers holds the body of a stag aloft. In one of the Jataka tale, Buddha has reincarnated into the form of a deer. The story originated in India around the 4th century BCE, hailing the merits of compassion, empathy and Karma. In some Scottish and Irish tales deer are seen as “fairy cattle” and are herded and milked by a benevolent otherworldly woman such as a bean idhe or the goddess Flidais who can shapeshift into the form of a red or white deer. In Ireland, The Cailleach Bheara (“The Old Woman of Beare”), who lives on an island off the coast of County Cork, takes the form of a deer to avoid capture and herds her deer down by the shore. The Beare peninsula is also associated with the islands in the western sea that are the lands of the dead. 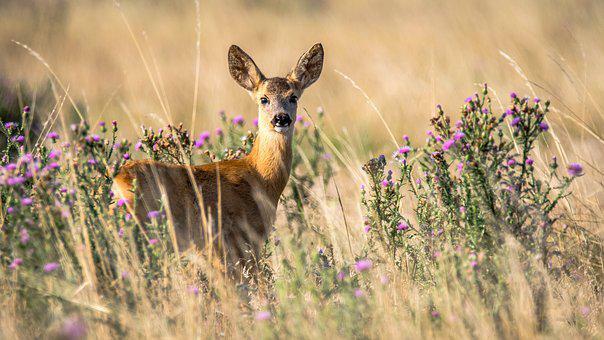 Other Celtic mythological figures also have connections to deer. The name of the legendary poet Oisin literally means “young deer” or fawn. His mother, Sadhbh, was turned into a deer by a druid, Fear Doirche. When hunter-warrior Fionn was hunting he caught her but did not kill her, and she returned to human form. Fionn gave up hunting to settle down with Sadhbh. Sadhbh was soon pregnant, but Fer Doirich turned her back into a deer and she returned to the wild. Seven years later Fionn found his child. 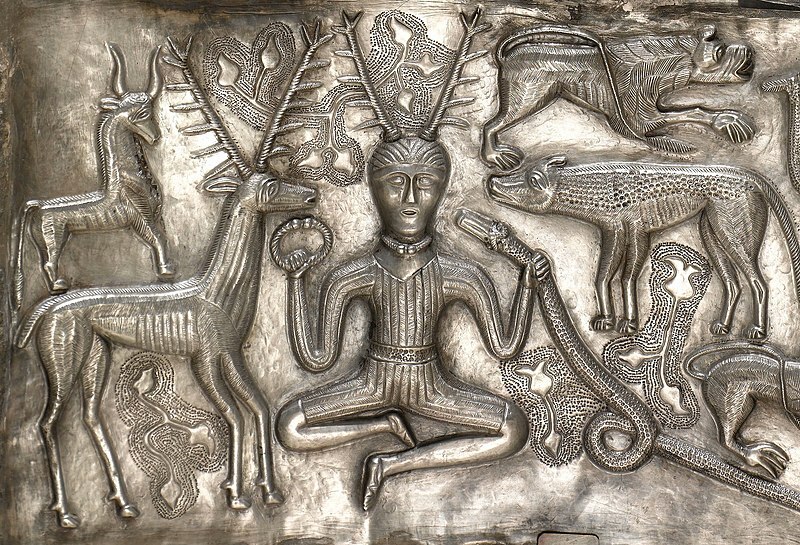 Cernunnos, the Celtic god of fertility, life, animals, wealth and the underworld, has deer or stag antlers. In the Poetic Edda poem Grimnismal, the four stags of Yggdrasil are described as feeding on the world tree. Early suggestions for interpretations of the stags included connecting them with the four elements, the four seasons or the phases of the moon. Artemis with a Stag. (Diana of Versailles). 1st – 2nd Century, C. E. (Discovered in 1792 in Rome). in golden armor and belt, you yoked a golden chariot, bridled deer in gold. For the Huichol people of Mexico, the “magical deer” represents both the power of maize to sustain the body and of the peyote cactus to feed and enlighten the spirit. Animals such as the eagle, jaguar, serpent and deer are of great importance to the Mexican indigenous cultures. For each group, however, one of these animals is of special significance and confers some of its qualities to the tribe. For the Huichol it is the deer that holds this intimate role. The Huichol hunt and sacrifice deer in their ceremonies. They make offerings to the Deer of the Maize to care for their crops, and to the Deer of the Peyote to bring them spiritual guidance and artistic inspiration. The stag is one of the most common motifs in Scythian art as the swift animal was believed to speed the spirits of the dead on their way. There are two epigrams about the death of deer, one more strange than the other. The first, by Apollonides, relates how a herd of deer sought refuge from their snow-clad mountains in the moist warmth of a river and were held fast there, to the delight of the country-folk, by a sudden frost which covered the river with ice. Tiberius Illustrius tells the fate of a dorkas which, escaping from hounds into the sea, is drawn to land by fishermen in their nets ; and in Didot III is an epitaph on a hind which was captured in similar fashion. Xenophon says that one can sometimes drive stags into the sea, an occurence which is frequently observed, since deer are excellent swimmers. Macedonius has a quatrain about a certain Codrus who caught a swift deer out of the waves of the sea. The myth of Saron is connected with a stag which took to the water of what was afterwards the Saronic Gulf; he pursued it into the waves and was drowned.